Crown Shape Address Number Wall Sign - - custom address plaque in the shape of a royal crown. Exclusively at Comfort House. Made in USA. When your home is your castle, a royal crown is a fitting house marker -- and sure to get the attention of your royal subjects and visiting dignitaries when they approach the palace. Is your last name King, Prince, Duke, Knight, or Arthur? 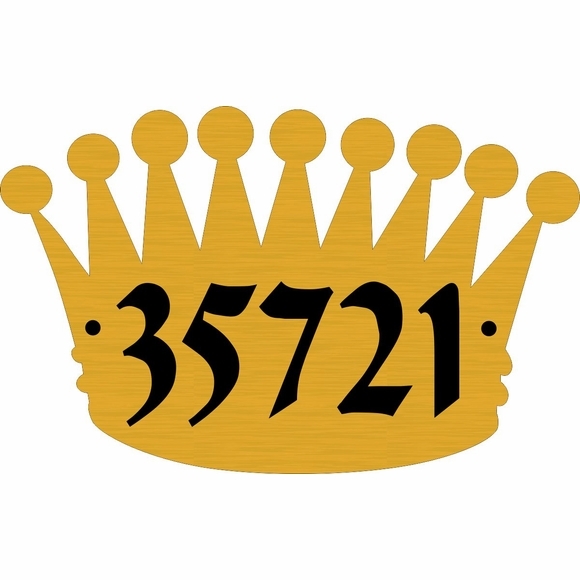 A personalized crown house number plaque could be considered subtle play on your name. Or a nine-pointed crown address plaque with your house number in old calligraphy font might suggest your fascination with the knights of the round table, King Arthur's Court, or all things medieval. Personalized one line address sign holds up to five (5) 3" characters or four (4) 3.5" characters. Note: the style number visible on the sample crown is for internal use only and is not engraved on your crown. Dimensions: 12"W x 7-5/8"H x 1/8. Crown Shape Address Number Wall Sign for your royal castle. Especially perfect for a Prince family or King family and other families with a "titled" name. A smaller Crown is available as a name sign for a room door (click top link in Related Products).